Our Santa Cruz Side Chairs sit perfectly around our Santa Cruz Dining Table and each features the signature Santa Cruz Tear Drop cut-out on the back and side slats. No piece of furniture is harder to build than a chair. It takes more stress, torque and movement than any other item, so much so that many companies do not build thier own chairs. We do. Notice the Solid Oak one piece Back Legs, Slats and Side Slats. This is where our craftsmanship really shines. Built to last and is also available in an Arm Chair. 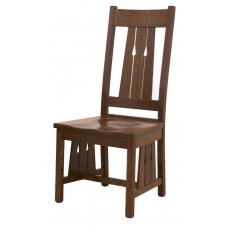 Our Clearly Amish series of furniture has a complete selection of Dining Room Furniture in several different styles. Every piece is "Bench Built" and hand crafted for exacting quality. We use hand selected, old growth, 5/4 Quartersawn Oak and Cherry wood from renewable sources. Each pieces uses Mortise and Tenon construction, Solid Dovetail Cedar Drawers, hand applied finishes with a conversion varnish, the most durable finish available. A perfect addition to your home.